Hi there! 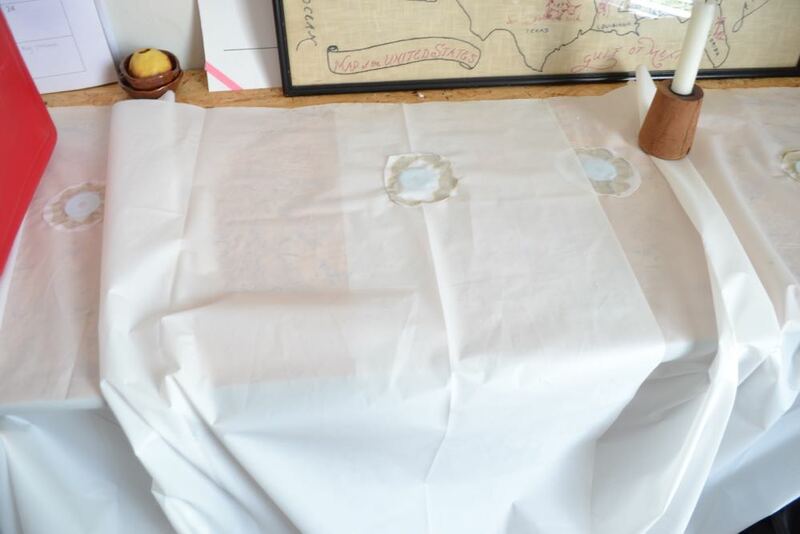 Today I’m sharing an update on our clawfoot tub shower curtain liner idea. 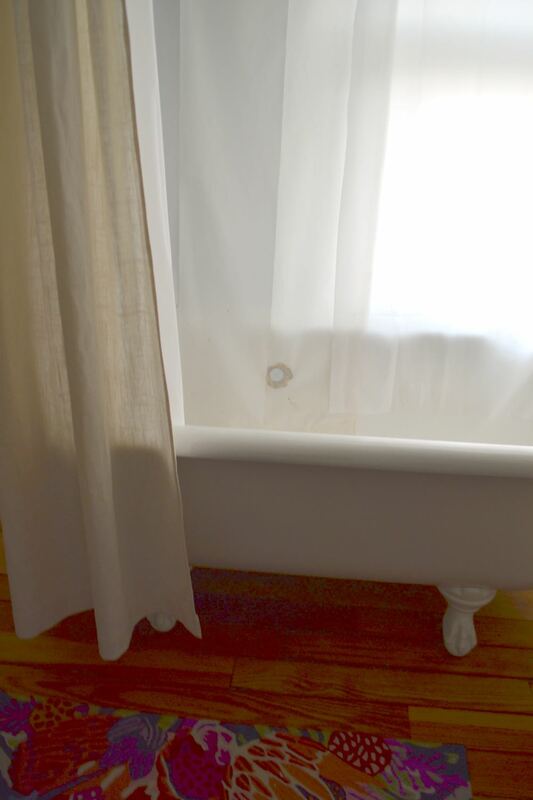 If you’ve been following along for a while now you know that we have a clawfoot tub as our primary shower. So, I’ve written several posts chronicling how we’re making that work. One of the first ones I did was about our shower curtain liner. There were a couple problems with a clawfoot tub shower curtain liner. The first was that basically no one (that I could find) makes one that fits the large, wrap around dimensions of a clawfoot tub. So, that was a relatively easy fix. But, the other problem was that because you have shower curtain on all sides of you (instead of just one like most traditional showers) there’s a lot of billowing and the liner sticks to you. For us, this wasn’t as bad during the summer, but has gotten exponentially worse now that the weather’s colder. Science fact: the cold air outside the shower and the warm air inside the shower are what cause it to billow like that. So, no you’re not crazy for only thinking it happens when it’s cold out! We tried solving this problem by gluing washers to our liner with Gorilla Glue. However, that didn’t last very long. The glue we used didn’t hold at all and slowly, over a couple months they almost all fell out. So, this week I tried the same thing, but with different glue. This time I used Liquid Nails which is rated for indoor/outdoor use. So, it should be able to stand up to elements. We’ll see if it can handle the shower or not. It’s been a couple weeks and they’re still holding up. You can see that the Liquid Nails glue is a brownish color that isn’t that attractive. But, it was incredibly simple. I just put it on and let it sit over night to fully cure. No clamping pressure necessary! And the washers are definitely heavy enough to do their job which is exciting. But, re-doing this also got me thinking that I’d really like to come up with a reusable solution. Inevitably we’re going to have to replace the liners at some point and even if this does work I’m not sure I want to have to do this every time we replace them. My wheels are definitely turning about how we could achieve that and over the next few months I’m hoping to test out some solutions. I’d also love to find an option that’s a little less ugly 😉 Of course I’ll keep you updated as I find the perfect clawfoot tub shower curtain liner idea. I just know there has to be one! Clawfoot Tub Shower: Sticking Problem Solved!